I alluded yesterday to tremendous enthusiasm for one CIFF screening that I hadn't even copped to screening yet, and today the one-eyed cat is out of the bag: I'm talking about Mary and Max, the feature debut by Oscar-winning Harvie Krumpet animator Adam Elliot, which opened this year's Sundance Film Festival but hasn't built the Stateside critical or cult followings that I would have predicted if I'd seen it in January. It's currently playing On Demand on the Sundance channel but will be eligible, apparently, for this year's hotly competitive Best Animated Feature Oscar. Good luck squeezing past all those airborne houses and fantastic foxes and tasty precipitations, but for my money, Mary and Max is the best of a high-caliber bunch. I'm so glad that Glenn Dunks, in this guest entry for Nathaniel last month, made a point of urging us all to keep track of all the recent phenoms from the Australian film market that have inexplicably had a hell of a time crossing over to American distributions, or even American film-blogger buzz. Big thanks to Glenn, to whom the full review is dedicatedand that was before I knew that today was his birthday, so obviously something is Mary and Max-ishly right with our transoceanic connection. Note, by the way, that even as I've hit my seventh straight day of consecutive full reviews for festival titles, I've decided to be less coy about telling you what I've caught so far, especially if it spurs any Chicagoans to check in on titles like Raging Sun, Raging Sky or About Elly while they're still in the CIFF rotation... or to avoid fatuous wastes of time like the empty, static, self-monumentalizing Vincere, though that one has obviously amassed its loyal fans since Cannes. Keep returning for more on the titles I haven't yet reviewed. It's an insane season at my job to be denying myself these extra hours of sleep, which is the only way to make time for all this writing, but I'm hopeful of posting a review every day through the 22nd, and I'm really enjoying myself. Mary and Max will play the Festival on Sunday 10/18 and Tuesday 10/20. Stay tuned for whether its projected candidacy for an Oscar nomination prompts a theatrical run somewhere in your city. Hurrah! I adored "Mary & Max" at Edinburgh. The tinest details from the film keep coming back to me months on -- just yesterday, I was thinking about Mary's dream of having a dog named Kevin, about which I'm still not sure whether to laugh or cry. How disappointing that "Vincere" sounds like such a miss -- my hopes, if not dashed, are a little dampened ahead of its LFF screening. Confess I sort of dug VINCERE, but it's a mess, yes, and I could never sit through it again. I like the image of women climbing the iron bars a lot--at least the first 1000 times they showed it. Sounds like you had much the same experience with Vincere that I did with Bellochio's L'ora di religione in Cannes a few years ago -- he can be quite the crashing bore. I liked Vincere. Not loved it but it was OK. The biggest win of the day though was that I managed to get a ticket for Police, Adjective next Saturday so I'm really excited to see this as I my mother tongue is Romanian. Whoa! That's a pretty scathing damnation of Vincere. Wait, shouldn't it be "self monumentalizing"? It's a movie about fascists and futurists, and that kind of over-the-top energy and self-mythologizing is embeded into the score, style, and acting. @Guy: The M&M Fan Club thrives! Very exciting. @Bill: There was an entire chorus of "Oooohs" in front of me during the biggest single moment of iron bar climbing. You know the one: in the snow. I can absolutely see the audience for this movie, but... I'm not in it. The same scenes over and over and over, plus ...see below. @Adelutza: Just saw Police, Adjective tonight. Hope you enjoy it! @Tim: "Testicle" is Max's fifth favorite word of all time—I won't ruin the other four–so it's officially an auteurist signature, right? @Jason: Well, I agree that this was the idea (behind the stentorian monumentality), but is the movie really "about" fascism, much less in a way that demands the movie has to be one to know one? And if so, how come after all that crashing music and grandiose spectacle, I still don't feel like I know anyone in it? Ida was such a cipher, and she had all the same scenes that some actress or other winds up having once a year; last year, it was Angelina Jolie, and you know Evan Rachel Wood is just dying for her turn. I must confess to loving Vincere a lot (opera is my great weakness), but I look forward to the full review. The real reason I'm commenting: if one had to choose between Mary and Max and My Neighbor, My Killer - and I have to do just that, on the 20th - what would you suggest that one should choose? Ooh, are grades align for "Police, Adjective". Really interested to your take on that one. I have to admit that my screening of the film was late at night, and arrived just after a screening of "A Prophet", so I think the film felt about ten times slower than it would've otherwise. Let's just say it wasn't exactly the film I needed to keep me galvanized at one in the morning. And there was meant to be a hear between the to and the your. I liked [rather than loved] Harvey Krumpet, but I'm still not confident I can handle Adam Elliott's sense of whimsy in feature-length format. I do really wanna get behind your About Elly endorsement though - Dogtooth and White Ribbon aside, it was the most gripping of the 50+ films I caught at the Melbourne Film Festival. The suspense plotting is pretty masterful (especially for a young filmmaker), but also, I don't think I've ever before seen the social dynamics among contemporary Iranian twenty-somethings presented at all, much less this acutely. I'm so glad you liked Mary & Max (B+!) I had a couple of issues with, mainly that the film flies by at such a rapid speed that when it slows down towards the end for the more "serious" stuff it actually felt more like the wind had gone out of its sails. That and I think perhaps Toni Collette could have been recast. I did however think Bethany Whitmore did some incredibly voice work at the young Mary, as did Phillip Seymour Hoffman and even Barry Humphries as the ever-present narrator (something that I thought would be a problem, but wasn't). I love the art of claymation though in general. It always brings out so much more creativity. You might be pleased to learn that Adam Elliot actually won the director of the year prize from the Australian Director's Guild, which is quite impressive give the strength of 2009 for Aussie films and, well, it's animated. If only American guilds could also realise that animated films have directors too. I am willing to send you tim tams. I've done it before! And thank you for the dedication. It was like a birthday perfect storm or something. BTW, will you be writing about "The Maid"? I wanna make a comment about it, but will wait. Wow, you all are reading! You just wanted more grades, you poor dears, or else you wanted me to see these particular movies. And look at how everyone's commenting twice! @YKGR: When I get to About Elly, I'll have to fess up that I think the suspense plotting in the script cheats a few times, though it's directed and acted so seductively that it works anyway. And yes, seeing this particular social idiom in an Iranian film was eye-opening in itself, for those of us whose exposure to Iranian cinema has tilted heavily to wind-scraped Kiarostami, et al. @Glenn: Well, then congrats are due to Adam! 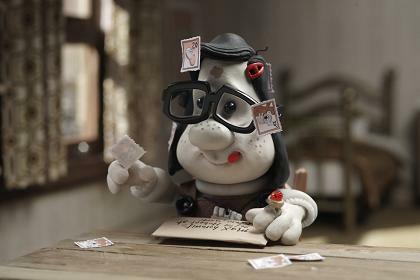 You're definitely right that Mary and Max has a windless-sails problem by the second half, and that I should have singled out Bethany Whitmore for more praise; she's aces as Young Mary. And it really is amazing that the copious narration never becomes overbearing. Maybe Barry Humphries should have tackled Vicky Cristina Barcelona? And yep, I’ll pipe up about The Maid. Truly, everyone was commenting twice. I did some quick vacuuming to get rid of two or three of those This post has been deleted by the author messages, but now it looks like I'm crazy, or at least over-stating the case. To say nothing of commenting twice. I think it's a testament to Barry Humphries, quite frankly. The way his voice crawls over certain words and phrases is so fun. Even better than the similarly cynical Geoffrey Rush narration in Harvey Krumpet. There are some films that really demand some time afterwards. "Antichrist" is one of those, as well, except I got to see a midnight screening of "Jennifer's Body" directly afterwards. Talk about two opposing ends of the horror spectrum. I suppose, that's the pain and delight of festivals. I think Philip Seymour Hoffman's oeuvre has gotten stronger with his vocal performance in this film. For me it ranks up his work in "Mary and Max" ranks up there with his performances in "The Savages," "Charlie Wilson's War," and "Synecdoche, New York." The "Max" section I thought was well done. I just thought that "Mary" could have been a little better. It was the "Julie and Julia" effect: if you place two stories on one plane, and one is better than the other, than the movie suffers. But I liked this one a lot better than the Streep/Adams film. I enjoyed this one, but I thought it could have avoided the loneliness cliches and masochistic depression sequences. For another non-hollywood animation, "Sita Sings the Blues," I thought was a much better film. Can you tell me Max's fav words of all times. I can't remember them all..Brilliant movie. @Steven: Happily. They are ointment, bumblebee, Vladivostok, banana, and testicle. I just watched Mary & Max. I was excited by Mary's left-handedness. But then I was disappointed, because it's just a continuity error: she's right-handed for the rest of the film. Hi, I'd stumbled on your review while on rotten tomatoes. It's the first time I've come across a review written such as yours. Although lengthy, I thought it captured the essence of the movie and your opinions fluidly. And it made me laugh! Thanks for a nice read!